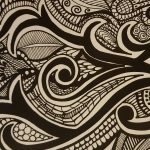 Adult coloring has become a very popular hobby to many people over the past several years. 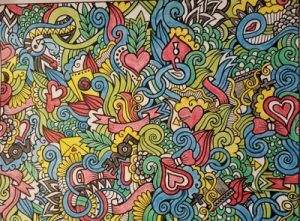 It has been said that adults who color images in coloring books find it very relaxing and stress relieving. 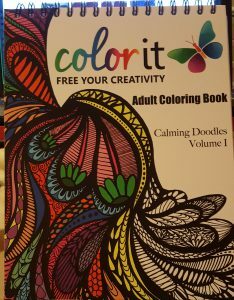 Since I started coloring three years ago, I have purchased many coloring books with different themes. However, the following books are my top 3. Spiral-bound book–since I am left-handed, having the spiral on the top of the book makes it much easier to color the images completely without having to worry about book creases. Good quality paper is used— the paper used for the images is excellent. The paper has a shiny quality to it and has some weight , like a thin cardboard. This makes it heavy enough to color images with markers and paints as well as pencils and crayons. If markers and water based paints are used, the colors will most likely not bleed onto the next page. The book even has an extra page you can use as a blotter to prevent bleeding just in case. Perforated pages for easy removal–if you want to frame your pictures, you can fold the paper where it is perforated and simply remove it without tearing the image. Can color directly from the book without using a desk–the front and back cover pages of the book are made of thick cardboard, which enables you to color images on your lap, especially if you are on-the-go. Gift bonus images–just for purchasing the book, you get access to a link that gives you 10 free bonus images to color as a thank-you gift. Please take note that when you give them your name and email address, you are also signing up for their newsletter. These images will not be found anywhere else. I really do not have any major drawbacks to think of, just some observations. All of the images are drawn with a black marker (ie. image to the right). Why are all the images drawn with a black marker? The book is 8″ by 11″ size. It would be nice if they had similar books in a smaller size, to make it convenient for travel. The price is about $16. Could be considered on the expensive side for those who do not wish to spend a lot to start with, but I think the quality of how the book is designed and the bonus images they offer is worth the price. I have by far enjoyed coloring images from this book because I like the variation of difficulty of the images contained in this book. In other words, sometimes if I wanted to color a simple image, I have found it in this book. 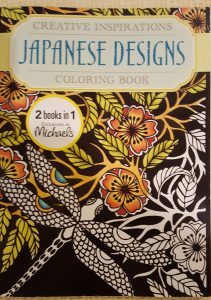 Likewise, if I wanted to color an image that is more intricate and difficult, I have also found it in this book. Good paper quality–paper has sufficient quality thickness to accept magic markers as well as colored pencils and crayons. Color chart– to help those who need tips on how to mix colors as well as defining which colors are primary, secondary, or tertiary. Perforated pages–can be removed from the book for framing, if desired. Quotes–pages contain quotes made by famous people regarding art. No major drawbacks. However, I wish that the quotes were put on separate pages instead of on the back page of an image. If I used magic markers that bled through to the next page, the quote would sometimes be hard to read. Another drawback is that the quote would be hidden, especially if the image on the adjacent page is hung on a wall. “2 Books in 1”–for $10, you get two coloring books. Half the book has pictures on a white background, and the other half has pictures on a black background. You have the option to either start coloring from the back cover and work your way forward, or start from the front cover and work your way back. Perforated pages–make it easier for you to remove pictures for framing or placing in scrapbooks. Excellent paper quality–paper used for the pictures is quite thick–so markers and watercolor pencils when water is applied will not bleed through the paper as much. Simplicity of pictures–the pictures contained in this book are relatively easy to color. In other words, the pictures do not have a lot of detailed or intricate lines that would take some time to complete. 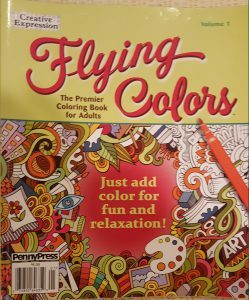 Great option for those who are either just starting out or who want to finish coloring a picture relatively quickly. What made me purchase this book was that I liked the pictures and the fact that I was able to get 2 books for one price. This book also satisfied my need to color something quick and simple whenever I got tired of coloring more detailed pictures. I can’t really explain it, but sometimes when I am coloring a picture in another book that is somewhat detailed and intricate, I get tired and want to take a “break”. My “break” consists of going to this book and finding a simpler picture that I can finish coloring in 30 minutes to an hour. The picture on the left took me over 2 hours to complete; the picture on the right took me about 30 minutes to complete. 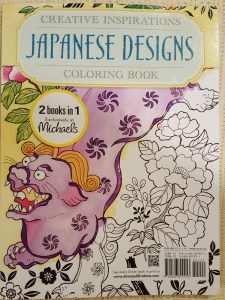 I hope that I have given you some ideas on how to select the best coloring books. 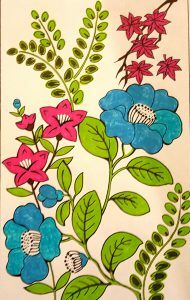 Overall, any coloring book you choose if you are just starting out will for the most part be fine; it just comes down to what you would like to color and how much time you want to devote to coloring a picture to completion. Any questions or comments? I would love to get other people’s perspective on how they choose coloring books. Please feel free to place your comment or question in the field below. Have a great day!